The monthly item this month is the Super Grain, which raises all herbivores in a herd by one grade. 1) Brother Woodchuck (#21071) with 536 snowballs thrown! 2) The Freaky ¥elociraptor ツ (#3513) with 521 snowballs thrown! 3) Jylani Amplex (#9064) with 439 snowballs thrown! 4) Lord Ike (#12329) with 390 snowballs thrown! 5) Iceni (#22839) with 363 snowballs thrown! Yay! Happy 1st of December everyone!! This month is the wonderful month where we get the Advent Calendar - which will provide you a daily free gift for every day in December - even after Christmas! Make sure to login every day to pickup all the items. Every item, bar a couple, are entirely new this year so have fun collecting them! The monthly donation item has changed and is now the Herbivore Hose! This will fill all empty troughs in a herbivore enclosure with water in one click to save you some time after grain feeding. And our winter snowball event is on! This is a dynamic event and requires you to be online so that snow falls on your farm - once you've got enough snow pieces, you can make snowballs to toss at other players to rack up points and win the winter food item! Happy thanksgiving everyone! The thanksgiving plushie is now available in the plushie store and will be restocking all day. I'd like to apologize for the lack of updates recently. I've been quite sick for the past couple of weeks which has made work difficult, but I'd like to assure you all that things are still getting done - but they're the boring things behind the scenes that you can't really see. Server tweaks, database modification, etc etc. I'll have something juicy for you guys very soon! 1) Eltafez (#77) with 273 infections! 2) Striker (#17510) with 205 infections! 3) Infectous Corruption (#6674) with 191 infections! 4) Nurit (#22009) with 187 infections! 5) Star (#1753) with 185 infections! The monthly donation item for November is the Bag of Health Goodies - an item that contains three gene improvers, to help with common genetical problems like slow brain syndrome and cleft palate. 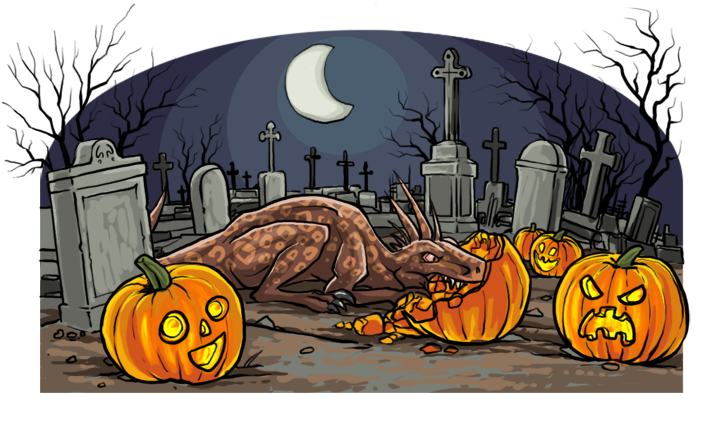 There is now an art and writing halloween-themed contest available for everyone to enter over on the contests page. With a prize of 20 scales each, it's worth a shot, right?! That's right guys! It's *halloween*! And what does that mean?! We have some events on at Exhibited! Club Wars is back! Each club has transformed its members into different "monsters" and has instigated war against other monsters! In order to defeat your enemies, you need to gather items to use on them which will appear around the site. On the 1st of November the winning club's team will award 2 scales to every player part of that club who participated (and attacked 50+ enemies). All the loser clubs will be given 20 tokens though! (If you attacked 50+ enemies).. So the fight is on! There are also some club-themed outfits available in the clothes store too. Raaarghh.. Brains... Must.. find.. brain..
You'll notice on the boards that everyone has a meter - this is your level of zombie infection. You have to tag other people to spread it but you can't tag fully infected players, players who last tagged you, or players you tagged last. Each tag also -1 from your infection, so it pays to invite others to tag you! The top 5 taggers on November 1st will be given 5 scales each. Pumpkins are floating around all over Exhibited and need you to find them! Once you find them you can head on over to the pumpkin patch to carve some jack-o-lanterns for your shelves. Clara is also working on some extra jack-o's for these too! Have a great Halloween guys! I'll be putting up a writing and art contest on Monday so stay tuned! Some updates for you guys today! All of these were board suggestions. * Enrichment items can now be compressed. * As requested, you can now see the name of the colors after previewing when creating a custom. Profiles got a revamp today and look a lot neater/cleaner! You'll also notice if you scroll down that everyone now has a shoutbox! This is a neat feature where you can leave messages to each other and scribble over people's farms. You can set your shoutbox to require approval before comments will show, or to disable it entirely. Any users you have blocked will also not be able to post on your shoutbox. * Enclosures, farms and quick farm have new designs. * Quick Farm also now lists happiness alongside health and hunger. * Userlogs now record when you have your daily login. * A new quest to find out secrets and clues about the NPCs. * Separating trading cards from your inventory into a card case. You'll notice that dinosaurs have disappeared from the main statistics page and are instead showing their stats on the museum page. Don't worry, this is intentional! In the future, I will be grouping dinosaurs into different size categories and plan to list their category under the game statistics section of their factfile, alongside other helpful information such as what foliage states they prefer, terrain types (alongside a future update), and what herbivore species they are able to hunt. As September draws to a close I'd also like to take a moment to remind you all that in October all of our Halloween events should be returning, as well as a couple of art and writing contests that hold the Halloween theme. Yay!